Bhanumathi Narasimhan is the sister of Gurudev Sri Sri Ravi Shankar, humanitarian leader and ambassador of peace, and shares his vision for a stress-free violence-free world.Bhanumathi is the Chairperson of Women’s Welfare and Child Care programs of the The Art of Living, a not-for-profit, educational and humanitarian NGO engaged in bringing stress relief and service initiatives in 155 countries. She has deep roots in spirituality and a broad vision for service to humanity. For over three decades, she has been committed to bringing a positive social transformation with a focus on education, environment and women empowerment. 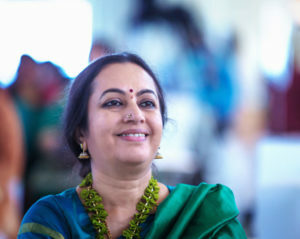 Enabling people to handle their negative emotions and stress with meditation and breathing techniques, she has helped them regain their self-confidence and come to the forefront to take responsibility for a harmonious society through service.